I knew our next door neighbor had a yappy little dog by the name of “Creampuff,” who she walks around the neighborhood all the time. But the parrot was news to me. Creampuff was going to stay with her grandson, Max, for the week. So, she just needed someone to make sure the parrot had food and water every day, and to clean the cage once in the middle of the week. It seemed like easy money! So that was kind of adorable. Brianna went NUTS and wanted to let Monty out of his cage, but I said NO. I was NOT born yesterday. That parrot would be impossible to catch, and with my luck, he’d find an open window somewhere and escape forever! Then my family would have to move, because if there’s anything I know about Mrs. Wallabanger, it’s that she SERIOUSLY loves her pets. But then Brianna asked why Monty had to be all alone here in Mrs. Wallabanger’s house when he could be at our house, with lots more company. It was a good question. Maybe Mrs. Wallabanger had just thought that was too much to ask. But I didn’t think my parents would mind! So I made Brianna promise that she would NOT under ANY circumstances let Monty out of his cage if he came over to our house. Then she carried the bag of birdseed and I managed to carry the cage full of a squawking Monty all the way back to our house. Dad said parrots give him the creeps and our dog Daisy was SUPER interested in what looked like a brightly colored snack, so I had to keep Monty in my room. Which was fine. Until the NIGHTTIME!!! I had just drifted off to sleep when Monty jolted me awake. I kept thinking he was done, but he kept screaming! Sometimes he’d give me a few minutes to drift back to sleep, and then JUST as I was about to doze off, he’d scream again. It was a ROUGH night. For everyone. In the morning, my parents had huge bags under their eyes. “That’s one noisy and smart bird…” Mom yawned. “…But I wish he would shut up!” Dad muttered into his coffee. “Way ahead of you,” I said, just as Monty screamed from the front porch, where I had set his cage. I grabbed the key to Mrs. Wallabanger’s house and hauled the cage back over. Things went fine for the rest of the week. I went over once a day to check on his food and water, just like Mrs. Wallabanger had asked me to. I might have overreacted when he screamed things at me, but sometimes, it’s good to let off steam and vent! The only thing was…on the last day before Mrs. Wallabanger was supposed to come back, I cleaned Monty’s cage. I finished up and made sure he had fresh water and some bird treats. “It’s been real, Monty,” I said, heading for the door. Which…might have been one of the things we muttered at him. Multiple times. He could say it perfectly by the time I left. Later that evening, I saw Mrs. Wallabanger return home. I watched from inside our house as she opened everything up to air out her stuffy house. OMG, it was the most EMBARRASSING thing ever!!! 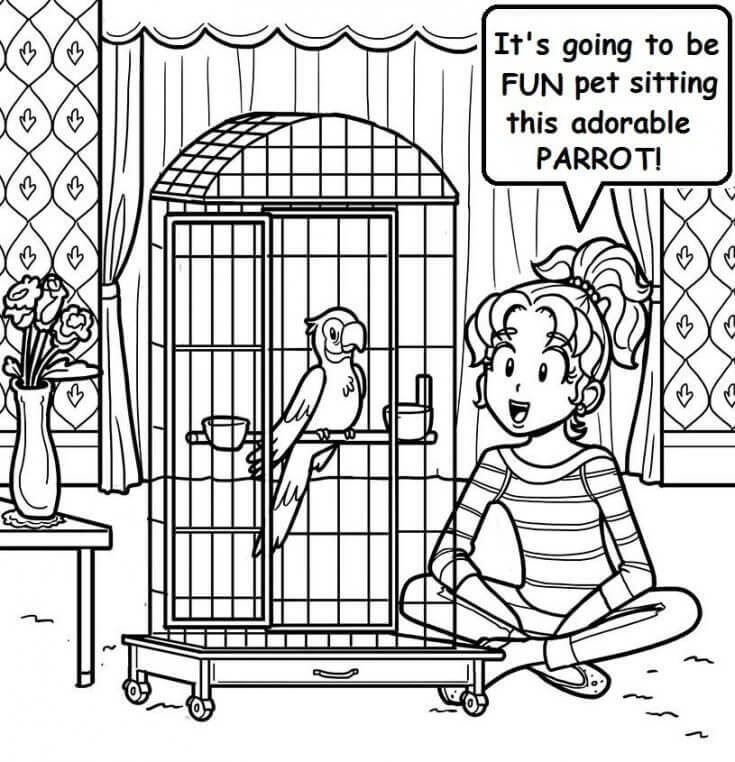 If you could teach a parrot to say something, what would it be? I have parakeets and their ADORABLE!! But having them is a CHALENGE!! I have to clean the cage! My brothers put their parakeet in the cage I bought for MY two parakeets! Lol!!! Did you get in trouble? I love birds and really want one, especially a green cheek conure. I will teach it to speak spainsh so he could say things that people might not understand. Wow Nikki! Taking care of a pet parrot? Seems a bit difficult, but I bet you got through it. My sister even once got to take care of a pet bunny, but she had to give it to her friend because our dad was strict about pets and the house being clean. I never had pets before… But if would sure be fun to have one. I would teach the parrot to say ” i wanna go on a cruise too!I wanna go on a cruise too!